Tax law changes are often a stand-alone proposition—tax rates go up or down, a new deduction is added to the Code, another deduction is eliminated, or a tax write-off is increased or decreased. It’s usually pretty easy to determine what the tax law change will mean for your clients. However, the Tax Cuts and Jobs Act of 2017 is a different story, with both pluses and minuses that will impact your clients in different ways. Here’s a rundown of five key changes that will likely affect the majority of your individual clients. Year after year, taxpayers have routinely claimed personal and dependency exemption deductions for themselves, their spouses and their dependents—but not this year. The Tax Cuts and Jobs Act effectively repeals the exemption deductions by reducing the exemption amount to zero. Before the enactment of the Tax Cuts and Jobs Act, the exemption amount was scheduled to be $4,150 for 2018. So, for a single taxpayer, the personal exemption would have sheltered $4,150 from tax in 2018. 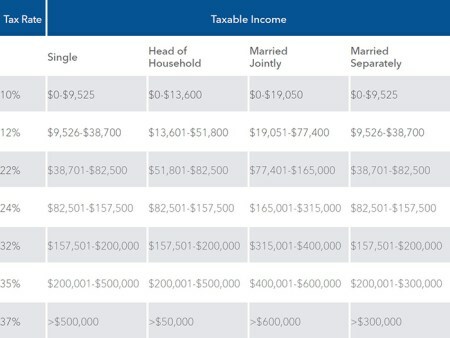 And for a family of four, the elimination of personal exemptions potentially exposes as much as $16,600 of income to tax in 2018. Under prior law, standard deduction amounts were scheduled to be $13,000 for married couples filing jointly and surviving spouses, $9,550 for heads of households, and $6,500 for single individuals and married individuals filing separately. For a single taxpayer who claims the standard deduction, the increase represents a $5,500 decrease in the amount of income subject to tax. For married couples filing jointly, the increased deduction shelters an additional $11,000 from tax. However, when the elimination of personal and dependency exemptions are factored into the equation, those figures change dramatically. For a single taxpayer with no dependents, the offset of the $4,150 exemption deduction against the $5,500 increase in the standard deduction results in a net decrease in taxable income of $1,350. By contrast, for a married couple with two dependent children, the loss of $16,600 in personal and dependency exemptions outpaces the $11,000 increase in the standard deduction, resulting in a net increase in taxable income of $5,600. The Tax Cuts and Jobs Act makes a number of changes in the rules for taxpayers who itemize deductions. For example, the new law temporarily resets the medical expense deduction limitation from 10% to 7.5% of adjusted gross income for 2018, does away with deductions for personal casualty and theft losses other than disaster losses, increases the deduction limit for some charitable contributions, bars write-offs of 2% miscellaneous itemized deductions, and eliminates the overall limit on itemized deductions. However, two key changes are most likely to affect your clients who have claimed itemized deductions in prior years. State and local tax deductions. For 2018, the new tax law places a $10,000 limit on itemized deductions for state and local income and property taxes. The deduction limit is $5,000 for married individuals filing separately. As in prior years, taxpayers can claim a deduction for state and local general sales taxes instead of deducting state and local income taxes; the $10,000/$5,000 deduction limit also applies to those taxes. In the past, there was no dollar limit on these deductions. Mortgage interest deductions. Under prior law, taxpayers could claim a deduction for interest up to $1 million ($500,000 for married individuals filing separately) of acquisition indebtedness incurred to buy, build or substantially improve a main home and one other residence. In addition, a deduction was allowed for the interest on up to $100,000 ($50,000 for married individuals filing separately) of home equity debt. The Tax Cuts and Jobs Act limits mortgage interest deduction to the interest on $750,000 ($375,000 for married individuals filing separately) of acquisition debt. The reduction in the dollar cap for acquisition debt does not apply to debt incurred on or before Dec. 15, 2017, or certain debt incurred pursuant to a binding contract entered into before that date. The deduction for interest paid on home equity loans and lines of credit is eliminated, unless they are used to buy, build or substantially improve the home of the taxpayer who secures the loan. The law changes are likely to push many of your clients into standard deduction territory. For example, joint filers whose itemized deductions have routinely been below $24,000 will generally find that the standard deduction produces a better result for 2018. In addition, some joint filers whose itemized deductions formerly topped $24,000 will find that the new law cutbacks reduce their allowable deductions below that mark. On the other hand, filers with substantial itemized deductions may continue to be better off itemizing, but they may see their deductions reduced as a result of the new law. As we have seen, the changes to exemptions and deductions may decrease—or even increase—a client’s taxable income for 2018. Exemptions and deductions do not tell the whole story, however. The new law also modifies the income tax rates and brackets for 2018. Under prior law, an individual taxpayer’s taxable income was taxed at a graduated rate of 10%, 15%, 25%, 28%, 33%, 35% and 39.6%. The new law reduces the rates to 10%, 12%, 22%, 24%, 32%, 35% and 37%. As a result of the new law changes, most taxpayers above the lowest 10% bracket will see a tax reduction compared to the rates under prior law. For example, a single taxpayer with $40,000 of taxable income will owe $4,739.50—$914.25 less than the $5,653.75 that would have been due under prior law. For joint filers, taxable income of $40,000 will produce a tax bill of $4,419 for 2018 compared to $5,047.50 under prior law—a tax cut of $628.50. For taxpayers with children or other dependents, one of the most significant provisions in the Tax Cuts and Jobs Act may be the changes to the child tax credit. As under prior law, taxpayers can claim a child tax credit for each qualifying child under age 17. However, the new law doubles the amount of the credit from $1,000 to $2,000 per child. For higher-income taxpayers, the new law also significantly raises the income levels at which the otherwise allowable credit is phased out. In the past, the total credit was reduced by $50 for each $1,000 (or fraction thereof) of income over $110,000 for joint filers, $75,000 for singles and heads of households, and $55,000 for married individuals filing separately. Under the new law, the reduction of the credit does not begin until income exceeds $400,000 on a joint return or $200,000 on all other returns. Up to $1,400 of credit per child is refundable for 2018. It should be noted, however, that the new law does include one crackdown on the child tax credit. Starting in 2018, taxpayers claiming a child credit will have to show the child’s Social Security number (SSN) on the return. In the past, a taxpayer could provide another tax identification number for a child without an SSN. New credit for other dependents. The new law creates a new $500 nonrefundable tax credit for dependents who do not qualify for the regular child tax credit, including children under 17 who do not have an SSN. The new credit is treated as part of the regular child credit in determining the amount of the credit reduction for higher-income taxpayers. KEY POINT: Most of the new law changes for individual taxpayers are “temporary” and are scheduled to expire in 2026. But 2026 is a long way off, and it remains to be seen how the tax law will shape up by then.